St. Clair River, Sept. 16, 2006. Initially constructed as a deep sea bulk carrier; this ship was built as hull #101G by Govan Division of Upper Clyde Shipbuilders Ltd., Govan, Scotland. 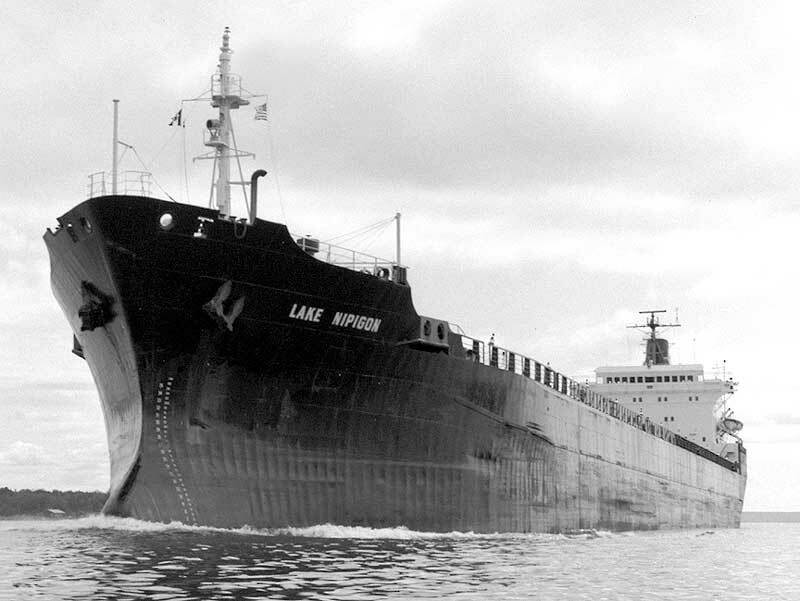 The bulk carrier was launched September 1, 1970 as the Temple Bar for Lambert Bros. Shipping Ltd., London, England. Her original dimensions were 527' 09" (160.86m) loa x 75' 02" (22.91m) beam x 42' 11" (13.08m) deep; 22,157 tons (22,513 mt) capacity.On September 7, 1976; the Temple Bar was sold to Nipigon Transport Ltd. (Carryore Ltd., managers), Montreal, QC; arriving at Jurong Shipyard Ltd., Singapore November 13, 1976 for lengthening and conversion for Great Lakes service. The vessel was originally powered by 2 Ruston 6,000 b.h.p. (4,413 kW) V-12 cylinder diesel engines built by Ruston Engine Division of English Electric Diesels Ltd., Lancaster, England. In 1974, the Temple Bar was repowered at Rotterdam, Netherlands with 2 Werkspoor 9TM410 9 cylinder 6,000 b.h.p. (4,413 kW) diesel engines burning intermediate grade 120 fuel oil, these engines being built by Stork-Werkspoor Diesel, Amsterdam, Netherlands. Power is fed to a controllable pitch propeller giving the vessel a speed of 16.1 m.p.h. (as rebuilt). 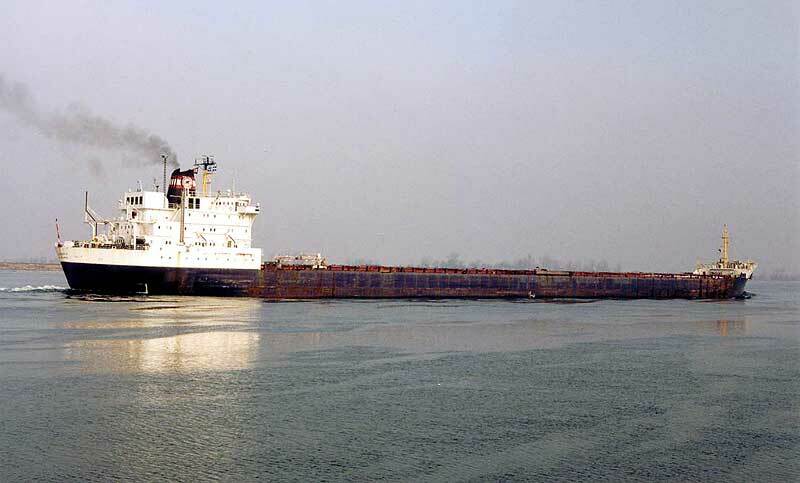 After being rebuilt to her current dimensions, the vessel is capable of carrying 28,750 tons (29,210 mt) at a mid-summer draft of 28' 06" (8.68m) or approximately 26,159 tons (26,579 mt) at the new Seaway draft of 26' 06" (8.08m); the cargo being contained in 5 holds serviced by 18 hatches. 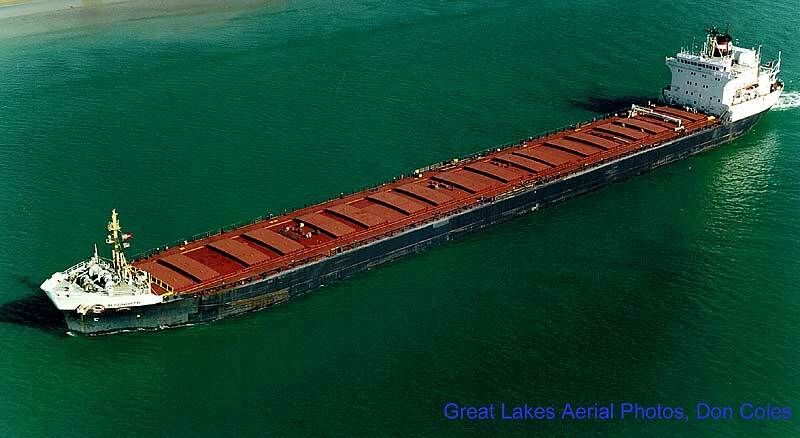 Her holds have the cubic capacity to carry 31,300 net tons (27,947 tons / 28,396 mt) of coal, 27,998 tons (28,448 mt) of wheat, 25,657 tons (26,069 mt) of corn or rye, 24,649 tons (25,045 mt) of barley or 22,649 tons (23,013 mt) of oats. Other capacities include 877 tons (891 mt) of fuel oil, 305 tons (310 mt) of diesel oil, 68 tons (69 mt) of potable water, and 10,433 tons (10,601 mt) of water ballast with the facility for hold flooding. She is also equipped with a 1,000 h.p. (736 kW) bow thruster. 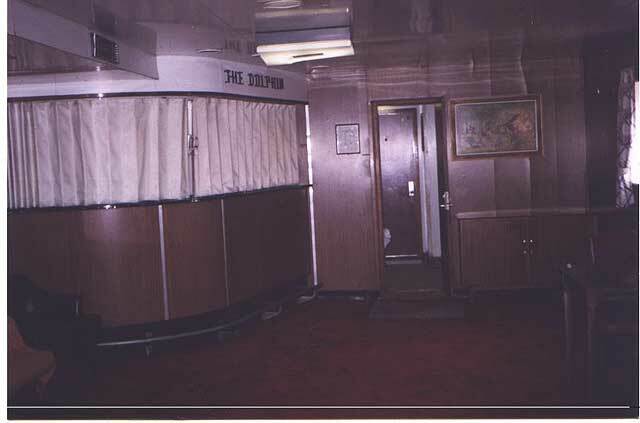 On April 9, 1977; the Temple Bar departed Singapore in Canadian registry arriving at Montreal, QC on May 13, 1977 having sailed to Canada via the Suez Canal. 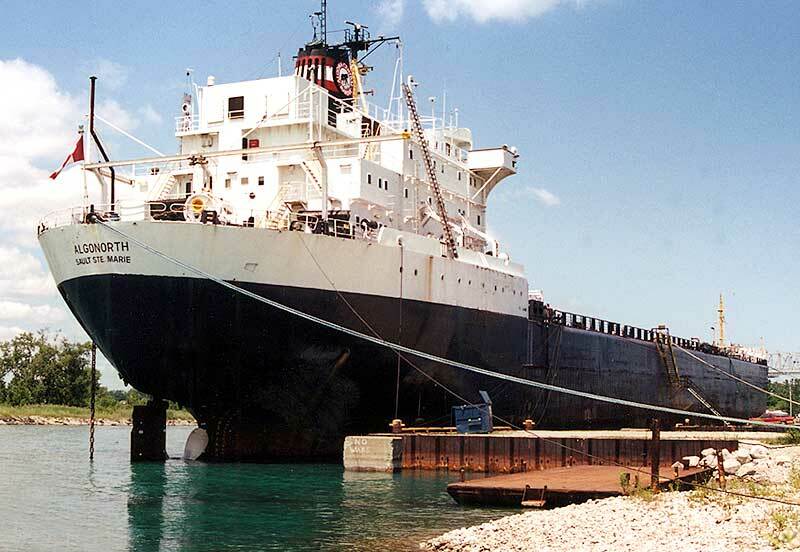 On May 19, 1977, she sailed on her maiden voyage up the Welland Canal to Port Colborne, ON for a refit, the installation of a hatch crane, deck winches, and the removal of the deep sea strengthening. While locking through the Canal, she was renamed Lake Nipigon. 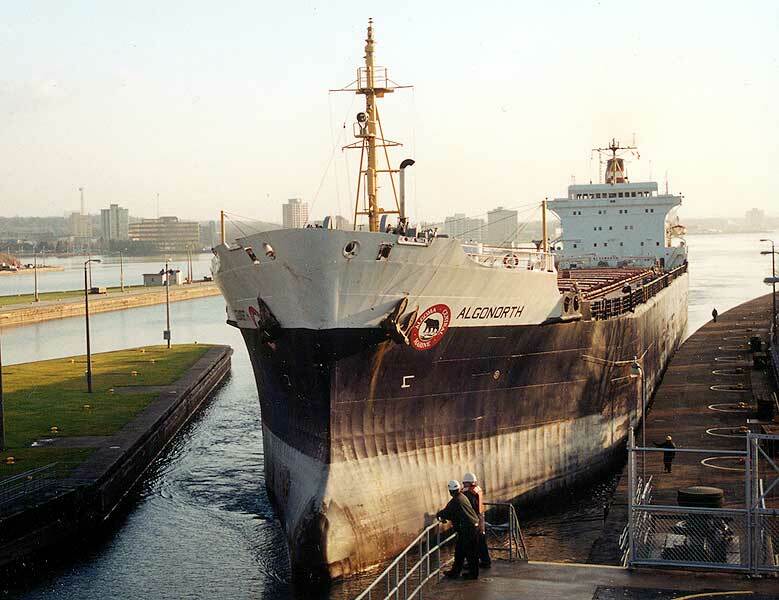 Algoma renamed the Lake Nipigon as the Algonorth in 1987 with the carrier entering service following a refit and paint at Port Weller Dry Docks, St. Catharines, ON during the summer of 1987. 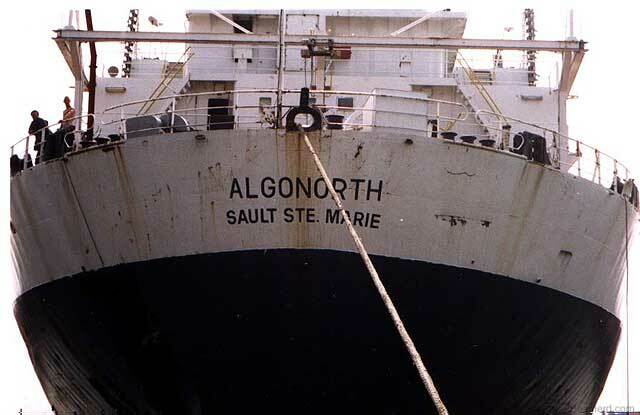 The vessel's new name assumes the fleet prefix "Algo" with "north" referring to Algoma's railway route north from Sault Ste. Marie, ON. 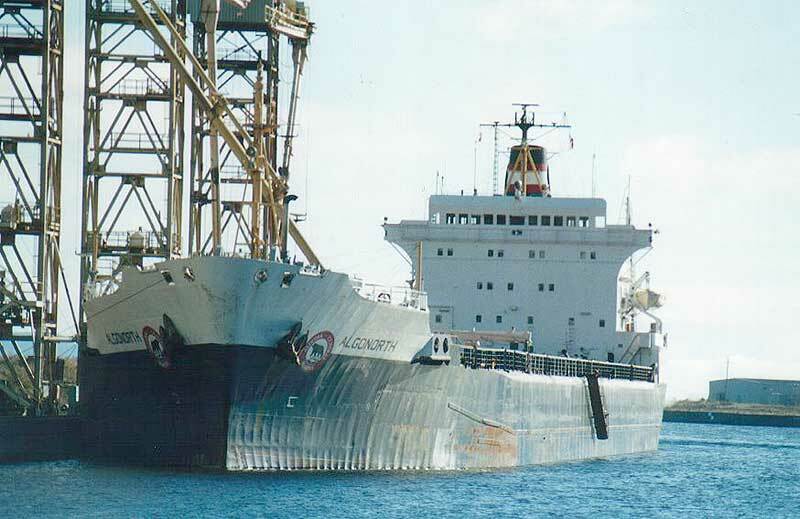 From 1993 through January 2000, the Algonorth sailed under the management of Seaway Bulk Carriers, Winnipeg, MB; a partnership of Algoma Central and Upper Lakes Group. On November 14, 1992; while departing Toledo, OH with a load of soybeans being assisted by tugs New Hampshire and Oregon, the Algonorth got caught in the swift currents of the Maumee River while attempting to line up with a drawbridge. Her bow struck the drawbridge supports and her stern swung across the channel striking the loading Murray Bay. No injuries and no serious damage to either vessel resulted. The Algonorth was freed from her strand the next day with the additional assistance of tugs Louisiana, Wisconsin, and Malcolm. 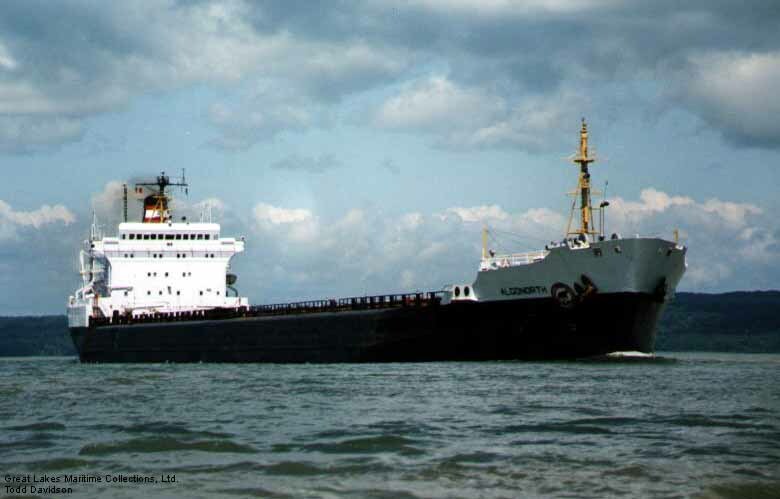 Then, on August 2, 1994; the Algonorth was noted to have been in collision with the salty Rixta Oldendorff in the Canal de Beauharnois section of the St. Lawrence Seaway. There was minor damage to both vessels but no injuries. 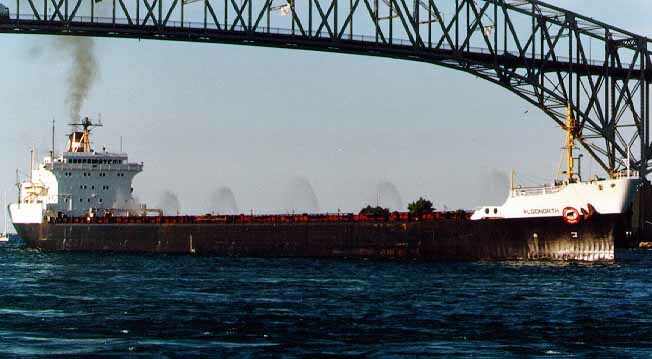 The Algonorth was upbound in the system at the time, bound for Hamilton, ON with iron ore. On July 30, 1995; the bulk carrier was in collision with the barge Medusa Conquest being pushed by the tug Susan Hannah in Lake St. Clair. Only superficial metal damage to the starboard side was suffered. 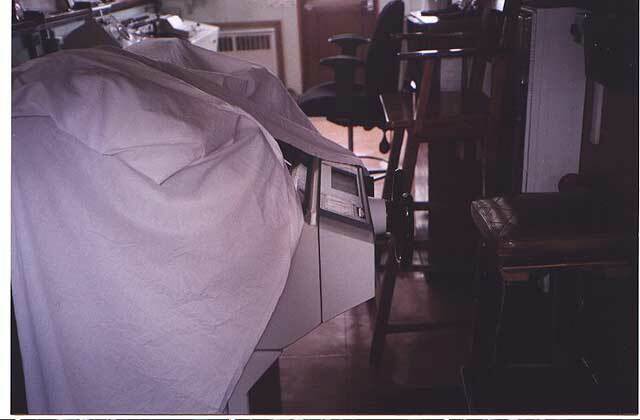 Late in 1996, the Algonorth was installed with a deck-mounted filtration unit with a testing lab and peripheral equipment for the Great Lakes Ballast Technology Demonstration Project (ballast water experiment) being conducted by the Lakes Carrier Association and the Northeast-Midwest Institute. The experiment was funded in part by a $1 million grant from the Great Lakes Protection fund to test the potential effectiveness and practicality of filtration as a ballast water treatment option to stop the transmission of unwanted organisms into the Great Lakes waters. 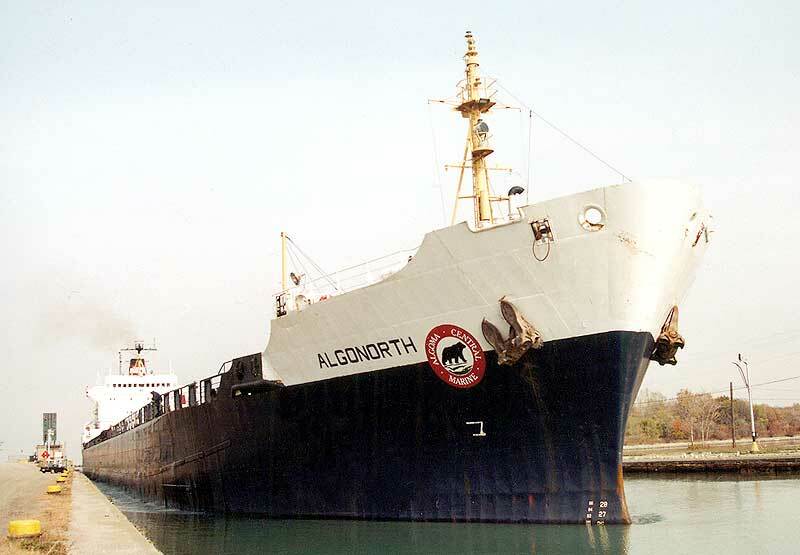 Algoma Central donated the Algonorth for use as the platform for the project due to its trade routes from the Gulf of St. Lawrence (salt water) into the Great Lakes and back. 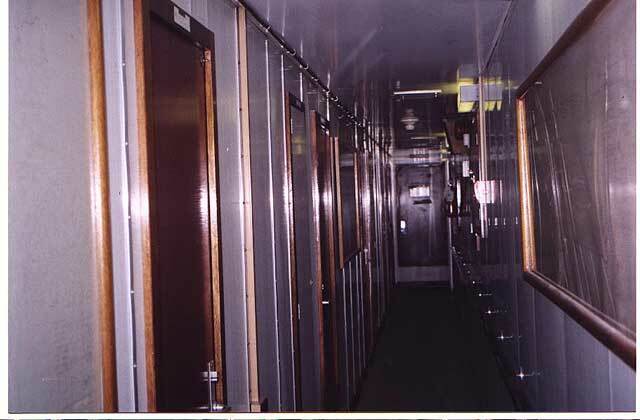 The Algonorth sailed the 1997 season so equipped (the project becoming known as the "Algonorth Project"). 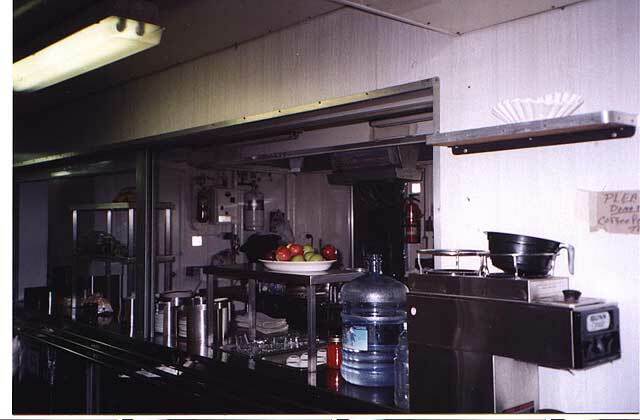 The equipment was removed from the Algonorth early in the 1998 season due to the vessel not sailing early in the season because of the fluctuating grain markets. The experimental equipment was placed on board a barge in Duluth, MN harbor. 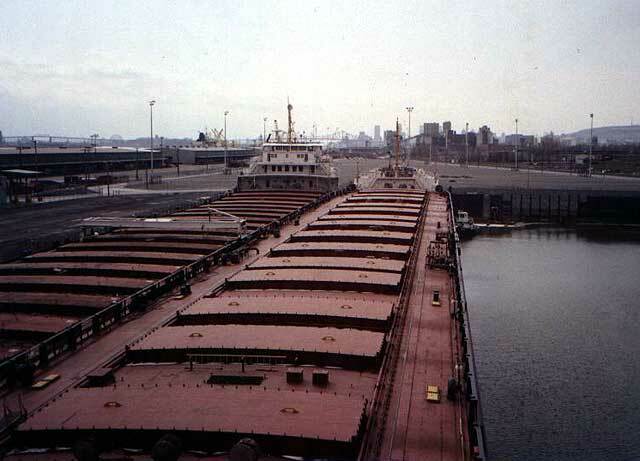 On December 20, 1999; the bulker became stuck on the bottom of Sarnia, ON's harbor after loading grain for Sorel, QC. She was freed the next day with no resulting damage. 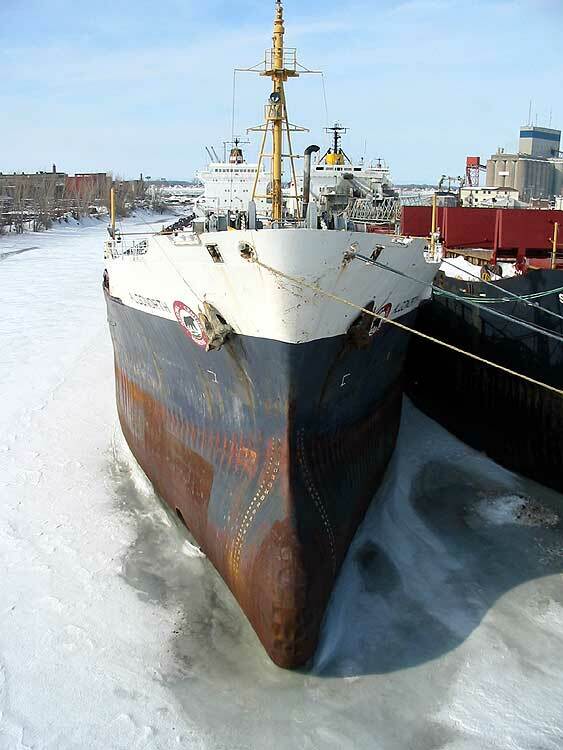 More recent notable incidents include the discovery on January 29, 2004 of a 19' 07" (6.0m) crack in her hull while drydocked at Pascol Engineering, Thunder Bay, ON. The cause was attributed to the extremely cold temperatures combined with the usual hull stress of a vessel being in a pumped out condition. On February 21, 2005, a smoldering fire was discovered in a storage cargo of sugar while the Algonorth was in winter lay-up at Redpath Sugar in Toronto, ON. The fire was quickly extinguished by the Toronto Harbour firefighters with the loss of approximately 5 tons of sugar and no vessel damage. 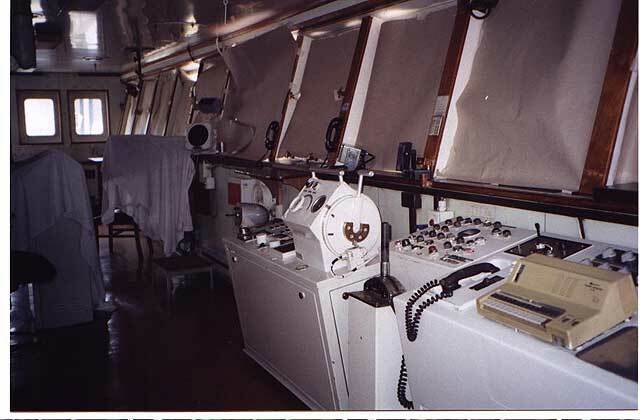 On August 19, 2005, a fire on Lake Superior affecting 3 electrical panels caused an engine room blackout forcing the Algonorth to drop anchor to prevent drifting in Lake Superior. The fire was ably contained and extinguished by the crew with no resulting injuries. Gravel and Lake Services tug Robert John from Thunder Bay took the bulker in tow back to Thunder Bay, ON for repairs. 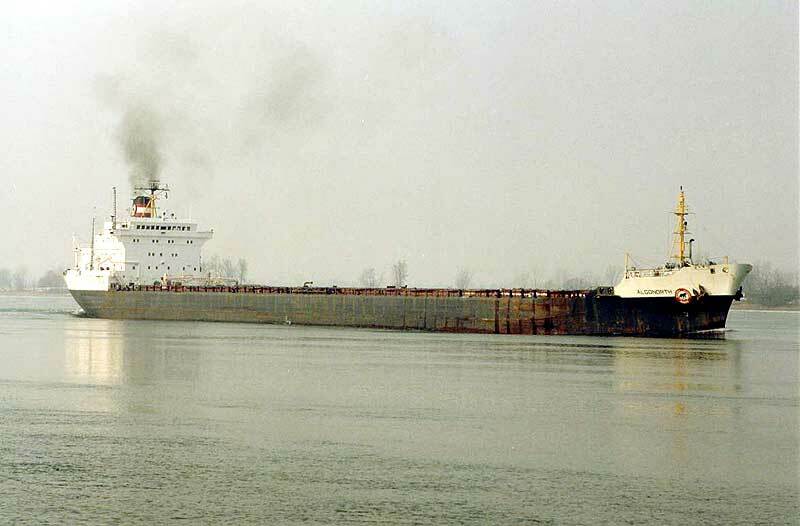 The Algonorth had departed Hamilton, ON on August 16 and was in transit to Thunder Bay in ballast to load when the fire took place. 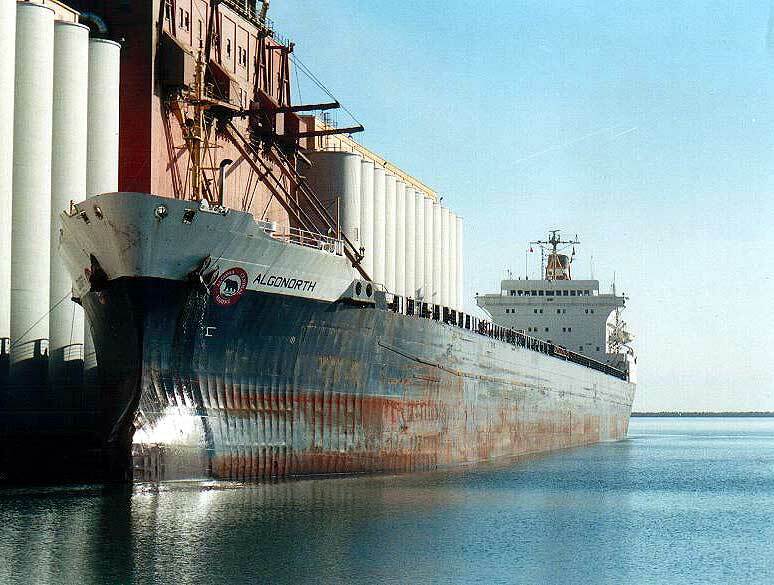 January 2000 saw the Algonorth sail under the new management of Seaway Marine Transport, St. Catharines, ON; a continued partnership of Algoma Central and Upper Lakes Group combining the bulker fleet of Seaway Bulk Transport with the self unloader fleet of Seaway Self Unloaders providing for the more effective and profitable utilization of the combined fleets. 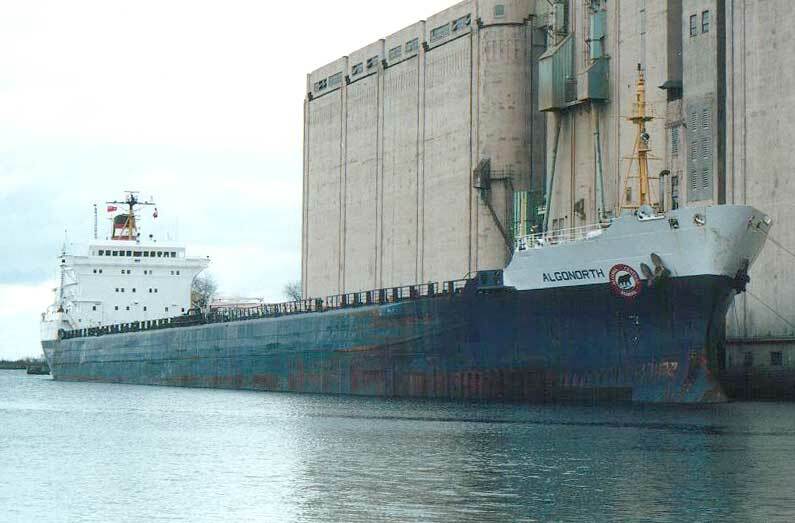 Cargoes for the Algonorth continue to be focused primarily on the iron ore trade from Gulf of St. Lawrence ports to lower Great Lakes ports, and grain products from upper Great Lakes ports back to elevators along the St. Lawrence River. 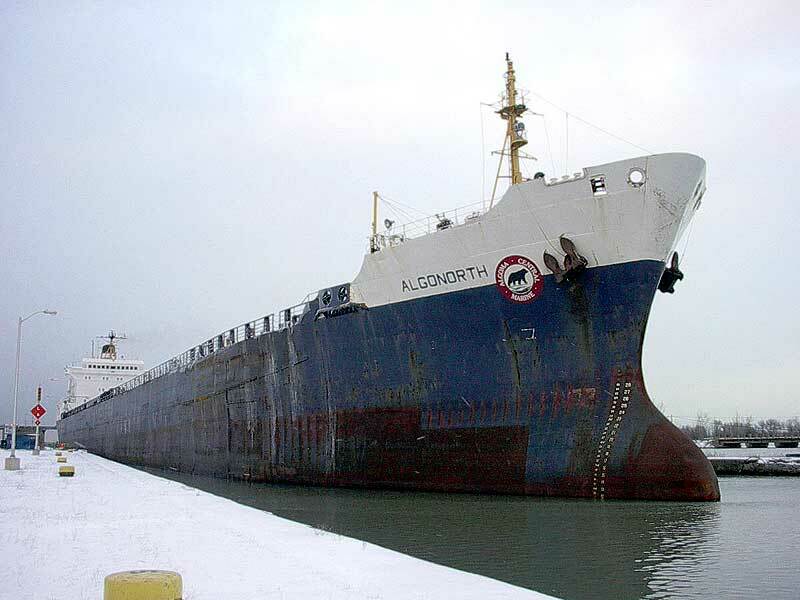 On May 10, 2006, the Algonorth laid up at Pier 10 in Hamilton, ON to assess mechanical (engine) problems. With a seized starboard engine crankshaft, parts availability range from 4 to 8 months. Operating on one engine, the Algonorth departed Hamilton on June 13, 2006 bound for Thunder Bay to resume her season. Welland Canal at Lock 7, Oct. 26, 2006. Layed up at Montreal, QC, Feb. 2006. 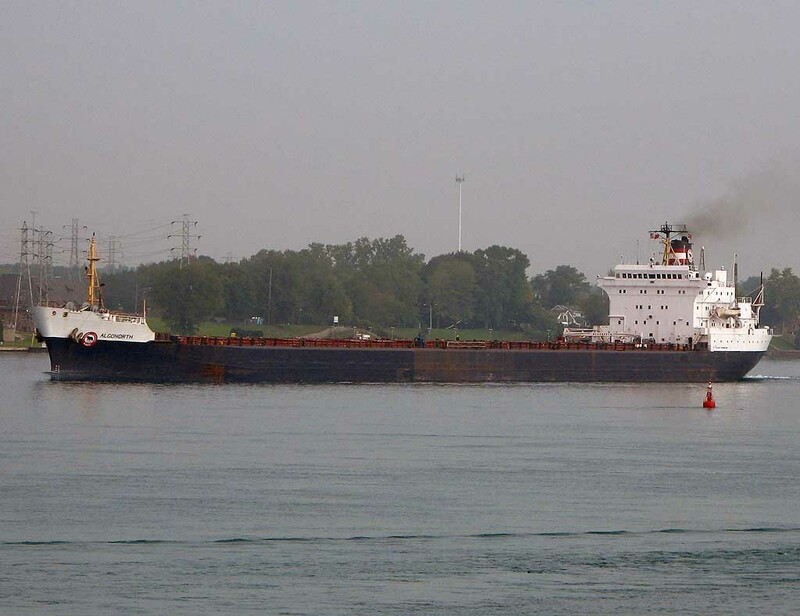 Inbound, Port Colborne piers, June 2006. Downbound off Lake Huron, Aug. 5, 2004. At Duluth-Superior on May 13, 2005. Detroit River, Aug. 17, 2004. 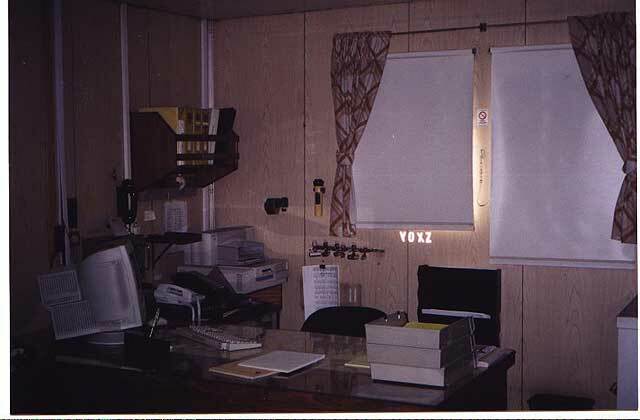 In Welland Canal Lock 7 in October, 1998. Upbound at the Soo, Sept. 26, 2004.